19th Century French manor house located within pretty English style gardens including beautiful David Austin Roses. The manor house has been beautifully renovated to include today's modern luxuries, but conserving its chic french charm. The property sits behind beautiful cast iron gates and has ample parking for 4 cars. 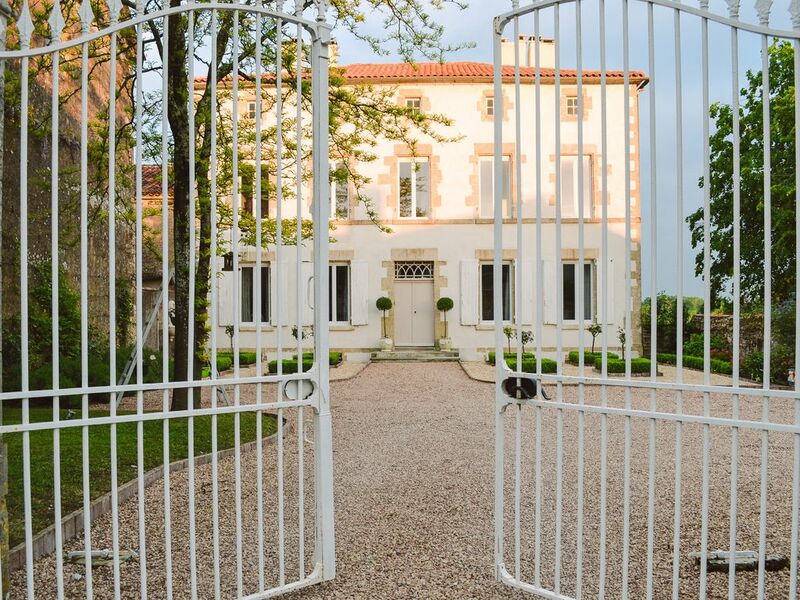 Spend the long summer evenings enjoying a glass of wine in the private walled in garden, take bike rides around the local countryside, enjoy gourmet cuisine in the beautiful city of La Rochelle or simply take time to relax in this tranquil property. The Manor House is located in the quaint historic village of Mouilleron en Pareds in the Vendee and only 1 hour from the hustle and bustle of La Rochelle. All rooms have been carefully renovated and beautifully decorated. with 5 burner hob and grill, microwave, integrated fridge freezer, double sink, breakfast bar that seats 4 and all necessary kitchen equipment. Reception Room (1): 3 Seater sofa, two arm chairs plus two occasional chairs. Wood burner for those cosy winter evenings (wood provided during winter months only). Reception Room (2): 4 Seater sofa, 3 seater sofa with a 42" TV with English Sky free view. Large guestroom with antique French double bed with matching armoire and dressing table. Sleeps 2. Beautiful claw foot bath with shower mixer tap, toilet, large hand basin, storage. Large landscaped courtyard to the front of the property (space for 4 cars), walled in private gardens, garden seating, garden lights, sun loungers, garden fire and seating. Bakery, highly recommended (offering croissants, pain au chocolat, huge choice of fresh bread, quiches, prefou, cakes etc (all fresh and homemade). We have just returned from our stay and immediately wish we could be back there. The house is simply beautiful. It has been renovated with great attention to detail and is presented perfectly. It is comfortable, clean, tidy and despite being full of character and period features has all the mod cons you would expect including a flat screen TV, superfast wifi, well-equipped kitchen etc etc. The extensive gardens were a key feature for us. Plenty of room to eat and relax outside as well as playing games. The location is great too. Very near quaint rural villages as well as some of the major attractions in this part of France that include water parks, swimming lakes, man-made beaches and of course ‘real beaches’. The owners could not have been kinder or more helpful. Offering the type of friendly and considerate advice that meant we got the most out of our break. The photos on the site are great but barely do the place justice. It is simply stunning. Enjoy. I hope we get the chance to go again sometime in the future. From the moment my family and I walked into this fairytale of a home we felt we'd stepped onto a movie set. From the curving wooden staircase; the pastel wallpaper; the authentic crockery; the outdoor cushions; the attention to detail was astounding! It made our stay both romantic (even with teenagers!) and memorable. Despite the intense temperatures the house remained cool due to the high ceilings. Christine was a generous host with cupboards full of condiments and always quick to respond if we had questions. Wow! As beautiful as it looks from the outside, it is equally so on the inside too! It is styled and decorated to perfection and really feels like home, with all of the practicalities sorted. We had no issues at all and everything was taken care of! The bedrooms, kitchen, dining and living rooms are all so spacious and will be perfect for a group of 6 like we were! In the evenings we were kept toasty by the fireplace and the living rooms are so cosy to spend time with friends and family. We flew into Nantes and it's just over an hour's drive. We were able to visit the nearby town of La Rochelle which is absolutely stunning (1 hour away) and a charming, small village nearby called Vouvant. Don't forget to try the bakery and the pizzeria just few minutes near the house! If you are swooning looking at the pictures, it is exactly like that and even more in person! This is a beautiful house in a peaceful location where you can really relax and forget about your daily grind. We stayed there with 3 children and there was plenty of space for all of us. Would definitely recommend. Have you ever felt like you were in a fairytale? We did, when visiting France recently and renting a French manor house in the small village of Mouilleron-En-Pareds. After visiting Paris it was like a breath of a fresh air - nice weather, friendly people, authentic French bakery and pub and many beautiful places to visit with your family (don’t forget to visit park Puy du Fou). On entering the house you catch yourself thinking that you are in a showhome, but all changes when you start to live there, because everything is where it should be. It’s a big kitchen with all you need to prepare a lovely dinner, it’s 3 big bedrooms all have beautiful views from the windows (try to open the windows and enjoy the sounds of birds and bees at dawn), a sweet garden where we spent some beautiful time having a coffee and pushing our child on a swing. We spent an unforgettable week here and would like to repeat it again in the future! Have you ever felt like you were in a fairytale? We did, when visiting France recently and renting a French manor house in the small village of Mouilleron-En-Pareds. After visiting Paris it was like a breath of a fresh air - nice weather, friendly people, authentic French bakery and pub and many beautiful places to visit with your family (don’t forget to visit park Puy du Fou).